Police: Accused drug lord moved tons of cocaine to U.S.
Edgar Valdez Villarreal was captured Monday after a shootout with Mexican police. Mexico City, Mexico (CNN) -- Authorities in Mexico revealed additional details Tuesday about an accused American-born drug kingpin detained Monday who they say moved tons of cocaine into the United States. Masked security forces in black uniforms and helmets, rifles in hand, escorted Edgar Valdez Villarreal and some of his accused associates before news reporters and photographers during a news conference Tuesday morning. Valdez is known as "La Barbie" because of his blue eyes and fair complexion, but investigators have described him as one of the most ruthless drug traffickers in Mexico. "The capture of Valdez Villarreal is a high-impact blow against organized crime," said Alejandro Poire, a spokesman for Mexico's president on security issues. "This is an important step in the national security strategy." 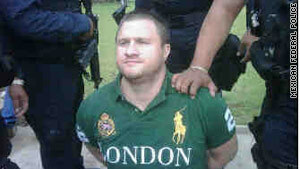 Valdez was responsible for smuggling about a ton of cocaine a month into the United States, authorities said Tuesday. They also displayed automatic rifles, ammunition and bags believed to contain drugs -- items they said police seized as they arrested him Monday. Authorities said they're continuing to investigate to try to learn more about Valdez's organization. Investigators arrested six people along with Valdez -- four men and two women, the state-run Notimex news agency reported. The six provided logistical help to Valdez in Mexico's Federal District, which includes the capital, Mexico City. Police recovered automatic weapons, nine packets of cocaine and three vehicles in the arrest, Notimex reported. Authorities identified the six who were arrested with Valdez as Maricela Reyes Lozada, 40; Juan Antonio Lopez Reyes, 26; Maritzel Lopez Reyes, 18; Mauricio Lopez Reyes, 25; Arturo Ivan Arroyo, 26, and Jorge Valentin Landa Coronado, 28, the news agency said. Viviana Macias, a spokeswoman for the federal attorney general's office, said Valdez' capture came after a shootout. The arrest, a high-profile win for Mexican authorities, followed intelligence operations in six Mexican states to determine Valdez's whereabouts, Poire said. He was captured in the state of Mexico, which borders Mexico City. This is an important step in the national security strategy. Valdez was allegedly a one-time top lieutenant of Mexico's most wanted man, Joaquin "El Chapo" Guzman. Valdez later joined the breakaway Beltran Leyva cartel, but the leader of that group, Arturo Beltran Leyva, was killed in a shootout with Mexican officials late last year. Beltran's brother Carlos was arrested, leaving Valdez in a fight to fill a power vacuum in one of Mexico's most powerful drug cartels. Lieutenants loyal to the cartel's co-founder deny Valdez is the group's leader, federal police have said. Valdez, thought to be the first U.S.-born cartel leader in Mexico, is accused in the United States of attempting to launder money and conspiring to import and distribute cocaine. He is believed to have played a key role in shipping roughly 100 kilograms of cocaine across the border at Laredo, Texas, every week for much of 2005, U.S. authorities have said. In June, U.S. Justice Department officials offered a $2 million reward for information leading to the capture of the alleged cocaine kingpin. His arrest comes on the heels of another big blow against the drug cartels. Ignacio "Nacho" Coronel Villareal, a principal leader of the Sinaloa drug cartel, was killed during a military raid in July. More than 28,000 people have died in drug-related violence since Mexican President Felipe Calderon intensified the government's fight against drug cartels and organized crime after taking office in December 2006, according to government figures. The president is under increasing pressure to show results.